It is interesting how there can be themes to sewing. This winter I have making new dresses and catching up on partially finished orders. Most of them have been burgundy or Aubergine. I love these colds, so this has been really great. Aim especially in love with the eggplant silk velvet I used in the two 1910's Titanic inspired dresses. 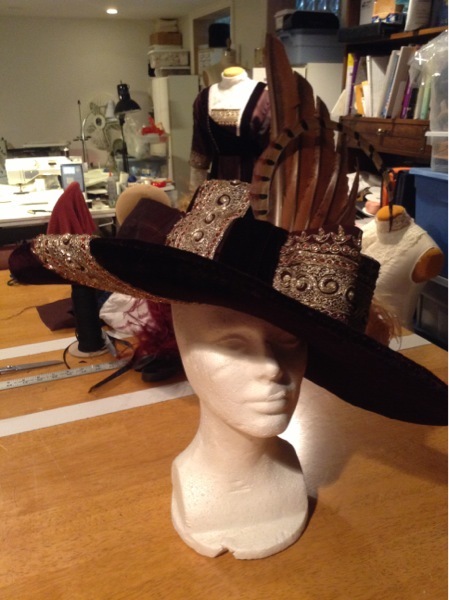 Judy Pushkin will soon have her new day outfit with matching dinner bodice. It is built on a fabulous new big bustle for that mid-1880's look. I untitled her striped silk by pleating her center front to the stripe and the skirt frill to the flower. Love it ! Vickie Lees's new 1912 dress was built for a Titanic dinner this past January. I was able to find a vintage sari trim that was the perfect highlight. I also made a picture hat with a deep crown and huge brim. These are so fun! The dress I just finished yesterday is a Titanic inspired prom dress. Noelle's inspiration was the Swim dress from the movie, but with darker palette and a sequined black sari as the highlight, I deviated a bit with the addition of a sheer kimono sleeve trimmed with beaded tassels. I hope she is the Belle of the Ball! And finally in the update, a slap-dash 1912 suit for MaritaBeth to wear to the Titanic exhibit in Dallas. She just had to have a fab dress, and of course, another awesome picture hat. I am completely in love with these, so dramatic! Now I am off to CA for the annual trip to see Ken and Gail. I am so looking forward to seeing them after missing last year's trip. Then a return to more sewing! See you in a week. Cheers!